Whether you're going to an organised Burn's Night Supper or hosting your own, for us, any good Burns Night starts where any great celebration should - dressing for the occasion. For Burns Night attire it has to be tartan. The whole night is about dressing up and celebrating Scotland and nothing is more Scottish than tartan! A Burns Night Supper is one of the events where people get the opportunity to express their cultural identity through the wearing of a Clan or family tartan. If your family surname is associated with a traditional Scottish clan name, then Gretna Green has a wide range of Family Clan Tartan products including ties, cufflinks and scarves to wear to a Burns Supper or clan gifts such as Scottish clan name plaques that make a great gift for your host or honoured guests. If you don't have connections to any of the major Scottish Clans or families, don't worry, you can wear one of the universal tartans, such as the Royal Stewart or Black Watch, these designs can be worn and enjoyed by anyone. Formal wear is customary at most organised Burns Night celebrations. Men, for example, are often encouraged to wear their full kilt outfit. We have some fantastic kilts that are perfect for Burns Night - or any Scottish celebration for that matter. With 6 popular tartans to choose from, there’s a colour/style to suit your needs perfectly. Don’t feel brave enough for the kilt? You can still look the part with a classic tartan waistcoat or even a simple tartan bow tie will add the required touch of tartan. We also stock a wide range of tartan trews (trousers) which feature the same tartans as our kilts but in a trouser - great for keeping your dignity when the ceilidh gets more lively! For the ladies we have a wide range of ladies cut kilts that are ideal for Burns Night celebrations. Matched with a tartan jacket they give a fantastic formal Scottish look - especially while sat at the table when your kilt can’t be seen. To stave off the chilly weather we love a tartan shawl, perfect for arriving at the venue of your Burns Supper (or keeping you warm during the meal - especially if you’re in a draughty hall!). Once you’re dressed to impress you can focus on the Burns Supper itself. Dressing the table with Scottish tableware can really transform the evening into something truly special. 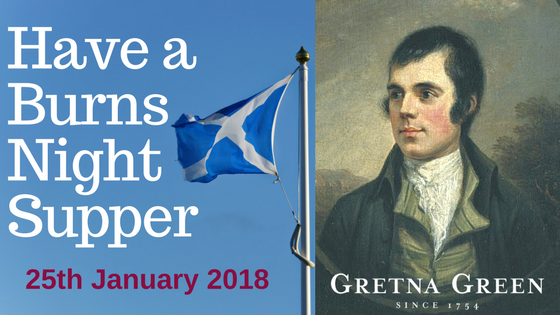 Here at Gretna Green, we have a wide range of tableware to choose from including a fantastic range of paper napkins that feature Scottish/ Burns night relevant messages. They’re an affordable way to add a flourish to your table. The Burns Supper features plenty of toasting… to make your toasts even more special we have a range of Scottish toasting quaichs. A quaich is a special Scottish two-handled drinking cup. Designed for communal toasting it’s a fantastic addition to the Burns Supper dinner table. For a guide to the running order of a traditional Burns Night, check out our comprehensive guide to the Burns Night traditions here. 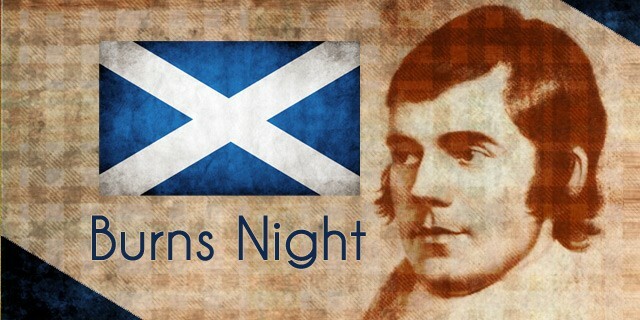 Check out the full range of our recommended Burns Night Products here.